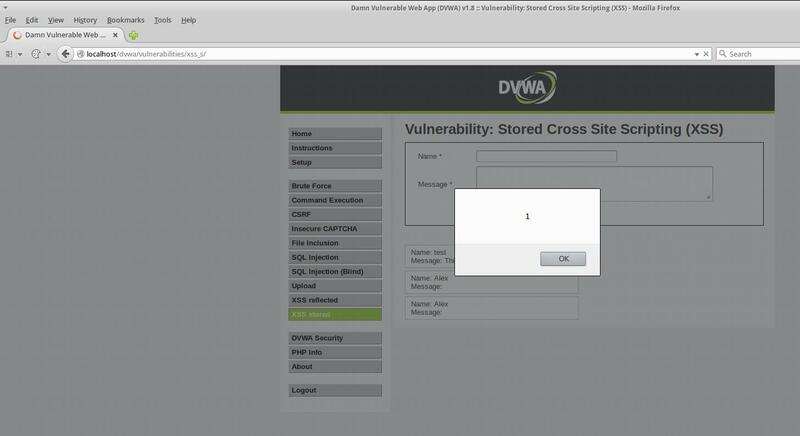 Damn Vulnerable Web Application (DVWA) is pre-installed in Samurai Web Testing Framework and Web Security Dojo (ethical hacking sandboxes, pre-configured vulnerable targets). However, the release version is likely outdated. temp="$(curl -sL -A 'Mozilla/5.0 (Windows NT 6.1) AppleWebKit/537.36 (KHTML, like Gecko) Chrome/41.0.2228.0 Safari/537.36' https://github.com/ethicalhack3r/DVWA/releases)"
In DVWA go to the Setup / Reset DB page and perform a reset / rebuild of the database. Go to http://localhost/dvwa/setup.php page to create / reset the database, click on the Create / Reset Database button. To install DVWA in Kali Linux follow this guide.